Rev Jim Huang Immigrated from Taiwan at the age of 11, He always held a special heart for Taiwan, and especifically, for Taiwanese American Churches. Jim’s parents widthheld their English speaking at home in order to preserve Jim’s ability in both Taiwanese and Mandarin. Thus, when God called Jim into full-time ministry in the middle of his college education, it was apparent that Jim would minister to Taiwanese Churches eventually. After graduating with a Bachelor of Science degree in Electrical Engineering, Jim immediately immersed himself into seminary education at Princeton Theological Seminary (PTS). He served at Taiwanese/American Fellowship Presbyterian Church (TAFPC) in New Brunswick as a pastoral assistant and Goleta Presbyterian Church as Youth Director during seminary years. 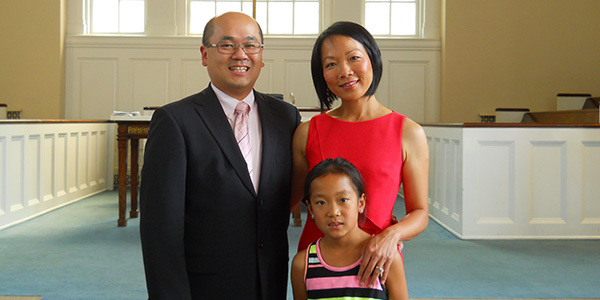 After receiving his Master of Divinity degree from PTS, Jim was ordained by National Capital Presbytery at Taiwanese Presbyterian Church of Washington DC, and served as the Associate Pastor for English Ministry for 3 years. In 2003, Jim moved to Ventura, California after receiving a call from First United Methodist Church there. Jim was the Associate Pastor for Congregational Growth and Young Families for the next 8 years. Prior coming back to TAFPC in September, 2014, Jim served as the solo pastor at Chinese Christian Church of Oxnard for 3 years. Jim is delighted to be at TAFPC, returning to his original call to ministry. Jim is supported by his wife, KuanFen Liu, their daughter Terilyn, and the Holy Spirit’s continual guidance and empowerment.